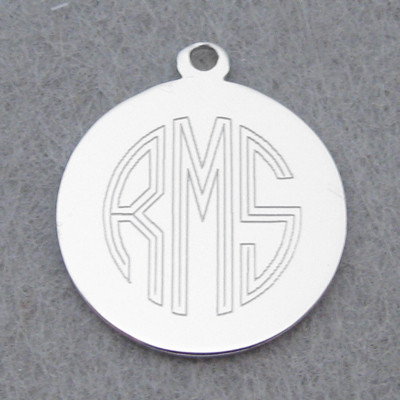 All of our personalized and engraved jewelry is crafted right in our own studio by a skilled engraving professional. Each piece is individually configured, including several test runs, to ensure that your specific inscription is produced in the best way possible. 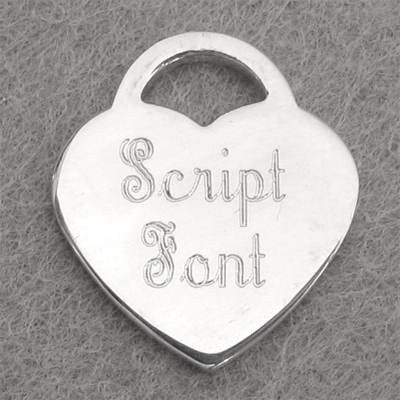 Some of our items come with engraving included in the price. 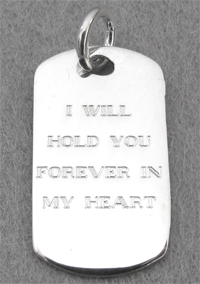 For each additional line of engraving there is a $5 labor charge, unless otherwise specified in the product description. We reserve the right to change the font and the layout you selected for the best possible fit on the piece. 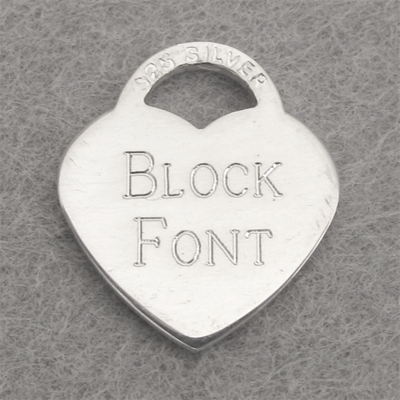 Machine Engraved Block font in all capital letters. On larger pieces, it will be an outlined block (left picture). On smaller pieces, it will be a single line block (right picture) and the first letter will be larger than the rest of the letters in the word. capital and lower case letters. all capital letters, for a handcrafted artisan look. This style is only available on a few select items. Please note that the hand stamped lettering is not intented to look "perfect". Variations in letter placement, spacing, and depth of the letters are to be expected. 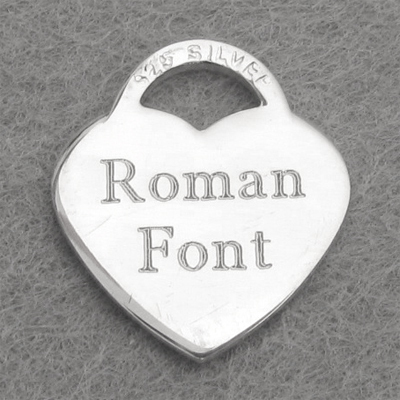 This engraving is done with small steel alphabet tools and are hammered deeply into the silver, which is atop a steel block. The opposite side of the piece may have marr marks from the engraving process. Extra polishing is done to reduce the visibliity of the marks. 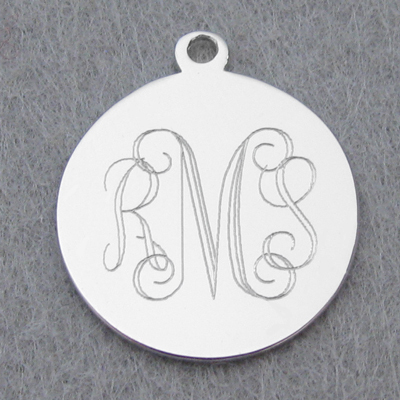 Monograms are the classic way to personalize items. The initial of the first name is on the left, the initial of the last name is in the center in a larger size, and initial of the middle name is on the right. If you are doing a monogram of married couple, the initial of the husband's first name is on the left, the initial of the couple's last name is in the center in a larger size, and the initial of the wife's first name is on the right. We offer four beautiful Monogram styles: Roman, Circle, Interlocking, and Fancy Script. Please input the exact way the engraving should read, either in your online order or in a separate email. *There is a $10 labor charge per item for engraving in these languages, your credit card will be charged the difference after your order is placed. *These languages are only available on our machine engraved pieces. Not available in hand stamped font or on the Posh Mommy Jewelry. 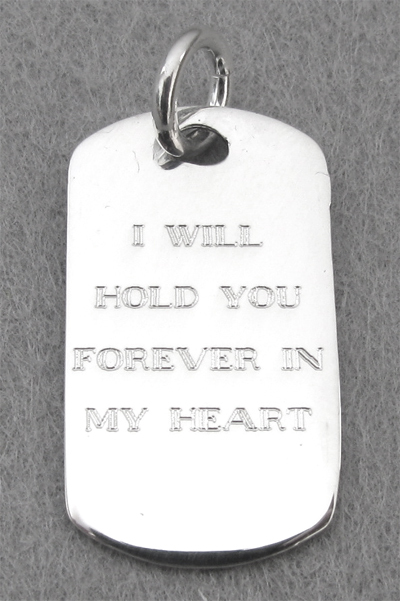 Items that are custom engraved for you are not returnable or refundable, unless there is an error on our part. 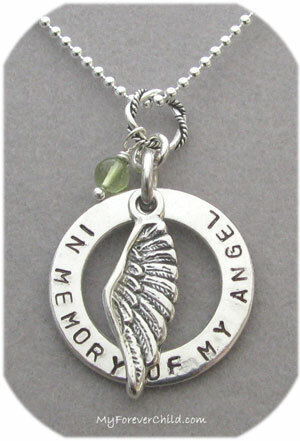 Engraved pieces are generally not able to be fixed and must be completely remade, which is very time consuming. If you had submitted the incorrect name or dates to be engraved on your order, you will be required to pay a charge for the reworking of the piece, plus the return postage back to you. Please email us for a price quote. Sterling silver is a relatively soft metal which scratches easily during normal wear. Please note that sterling silver WILL scratch if it rubs against harder materials such as crystals, keys, stone and metal surfaces. This is normal and to be expected. Each of our engraved items is polished a minimum of 4 different ways to reduce surface scratches. Some items may appear to have scratches or dings. These cannot be polished out, as they are part of the metal itself and enhance the character of the individual handcrafted piece. Sterling silver will take on a patina of it's own, developing numerous small scratches, with normal wear. Each of our engraved pieces is wrapped in anti-tarnish tissue paper to avoid damage during shipping.